You just know it’s going to be a different kind of wedding filming day when the first thing you notice is a bank of paparazzi with huge telescopic lens hanging around their necks huddled outside the church. Add to that at least six burly security staff guarding the entrance talking into their walkie talkies, and you immediately get a taste of what’s in store at an OK! Magazine celebrity wedding. 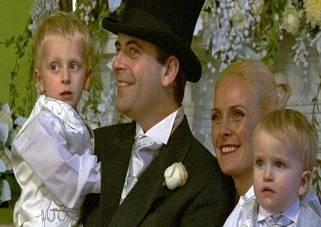 Wedding Productions were asked by Coronation Street actor Simon Gregson and his fiancée Emma Gleave to film their winter wedding in Cheshire. Working closely with wedding planner to the rich and famous Liz Taylor, we quickly realised this wedding celebration would definitely need two cameras. As with all weddings you can only be in one place at one time and with celebrity guests arriving at the front, and the bride & groom arriving in secret at the back, we knew working with two cameras was the only way to guarantee we captured everything. The constant timing updates from the security staff also allowed us to ensure we were always in the right place at the right time, including capturing the bridesmaids holding back the tears as they saw the bride for the first time while Simon and best-man Craig Charles waited at the altar. During the ceremony, I positioned myself in the choir stalls behind a huge glittering white floral display which although hid me from the guests, meant I had a wonderful view of the couple as they said their vows. My partner Mike occupied an elevated position at the rear of the church, always a great shot to capture the enormity of the venue and add a real sense of occasion to the final DVD. After the ceremony the bride & groom walked down the aisle together for the first time as man and wife - straight into a pair of long velvet cloaks, a necessary precaution to ensure the waiting paparazzi were denied the shot they craved as the couple climbed into the waiting limousine. At the reception venue, the OK! Photographers worked quickly and efficiently, with the lighting and flowers all ready and prepared for the group shots. The Coronation Street actors dutifully lined up waiting their turn, each and every one looking extremely glamorous and smiling right on cue. With only one hour set aside for the reception drinks we had a great deal to cover so I filmed the photo shoots, a great way to ensure every key member of Emma’s DVD, while Mike had the busier task of filming the reception drinks, singer Cole Page and the reception room. Normally when the bride and groom sit down for their wedding breakfast, we get five minutes to catch our breath, but with entertainment planned all night we did not dare leave our cameras unattended as this was the kind of wedding where anything could happen at any time - and I can assure you, it did! Visit our website www.weddingproductions.co.uk to see an exclusive short clip from the Simon and Emma’s OK! Celebrity wedding. FRozaz I value the article.Much thanks again. Really Cool. G3ALcL I think this is a real great blog post.Really looking forward to read more. Awesome.